Cruise Australia New Zealand for bucket list wonders down under. Australia and New Zealand kept calling our names, but let’s face it, they are a long way from home. I was a little overwhelmed by the complicated planning aspects of trying to fly around the huge continent of Australia and how to navigate both islands in New Zealand. The easy way, to see a lot in a short time, was a luxury cruise to both countries. 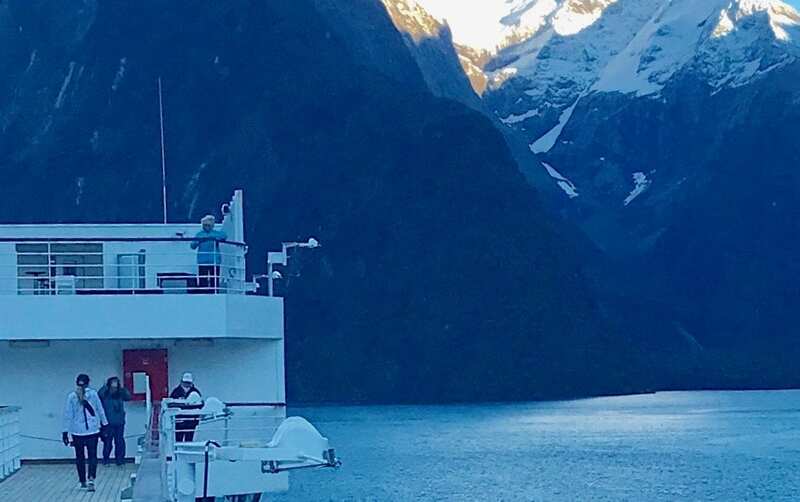 So we booked a 14-day cruise on the Noordam, Holland America’s 1,900-passenger classic vessel departing from Sydney, Australia and finishing in Auckland, New Zealand. Melbourne, is a vibrant cultural center with cutting-edge art, architecture, historic galleries and museums. On a walking tour we explored a labyrinth of arcades and alleyways with gardens, mural art, a vibrant Chinatown plus a dizzying array of restaurants, rooftop bars, bistros, and markets. From Melbourne we sailed across the Bass Straight between Australia and Tasmania, a scenic passage dotted with more than 100 islands to Hobart, Tasmania.